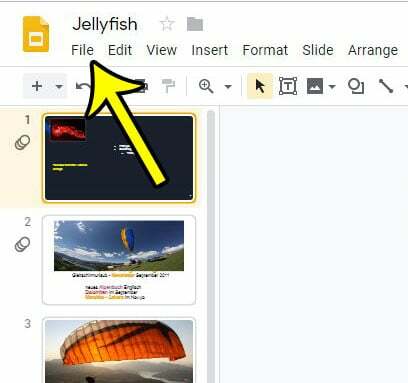 Google Slides presentations can often make good use of the various themes that are available by default. Simply applying one of these themes to your slideshow can instantly make it more visually appealing, which helps to engage your audience. Occasionally, however, you may find yourself in a situation where you need to print your presentation. And while the background of your theme looks good on a computer screen, those solid-colored backgrounds can use a lot of ink. 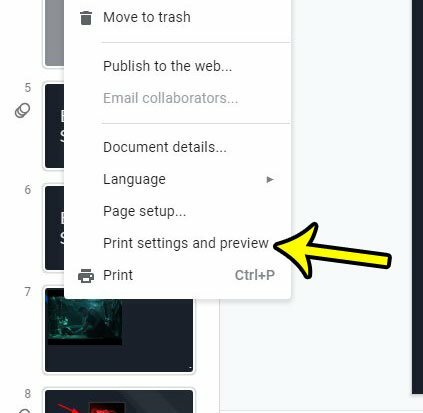 Fortunately Google Slides has a setting that allows you to print your presentation without that background color. The steps in this article were performed on the desktop version of Google Chrome, but will work in other browsers as well. Step 1: Sign into your Google Drive and open the presentation that you want to print. Step 3: Select the Print settings & preview option. Step 4: Click the Hide background button, then click the Print button. You should now see a preview of how your slideshow will look when it’s printed without the backgrounds. 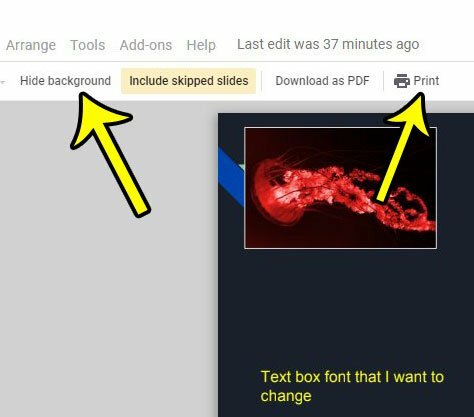 Another helpful change that you can make to your slideshow if you are going to print it is the addition of slide numbers. Find out how to add slide numbers in Google Slides and make it easier to keep track of where you are in the presentation.